for 2nd Fridays on October 14th, 2016. The Lanna, or Northern Thai cuisine, Khantoke dinner is a unique dinner rarely seen outside of Northern Thailand. 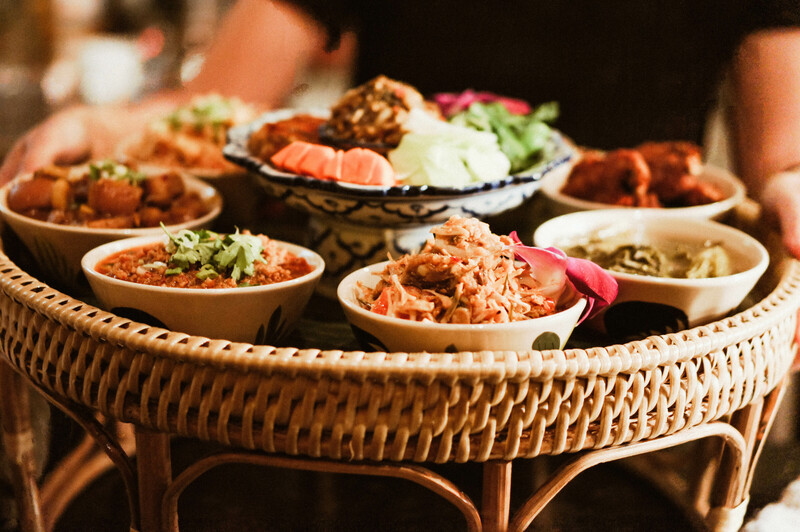 Traditional Thai meals are rarely one plate experiences and because people in Northern Thailand often sit on the floor when eating, the Khantoke is used as a pedestal dining tray that showcases a vast variety of main and side dishes. This method of eating transcends social strata, and is seen in everyday family dinners to special occasions such as weddings or housewarming parties. 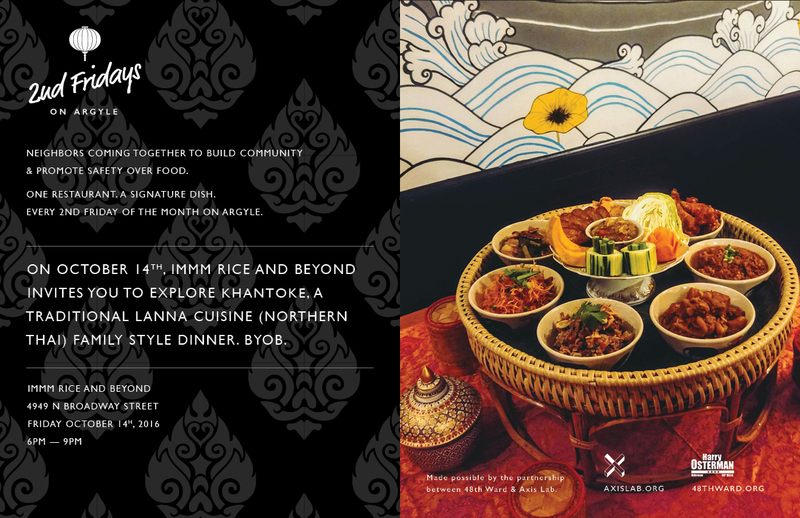 Chef owner Dew Suriyawan and his business partner Noon Tosakulwong of Immm Rice & Beyond invite you to explore this very unique and special dinner from Chef Dew’s hometown of Chiang Mai in Northern Thailand for 2nd Fridays on October 14th, 2016. 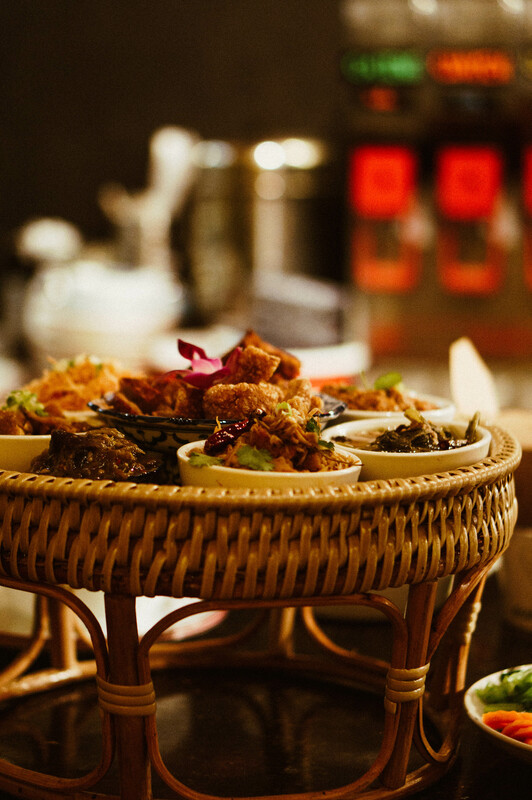 Both Suriyawan and Tosakulwong have had a long history with Thai cuisine. Suriyawan, who came to the U.S. as a student 9 years ago, worked in various Thai kitchens across Chicago and took over ownership of Spoon Thai with his sister in 2012. Toaskulwong, who learned the methods of home cooking at a young age in her mother’s kitchen, applied that knowledge where she also worked in many Thai kitchens in Chicago since moving here at the age of 16. 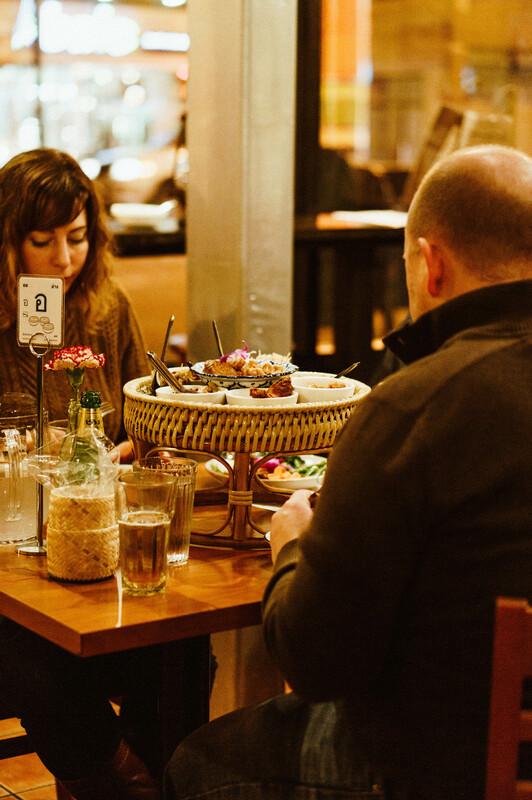 The owners’ motivation in opening Immm Rice & Beyond lies in the importance of offering more traditional street food often not found within many Thai restaurants across Chicago. Tosakulwong says, “Several Thai restaurants throughout Chicago do offer a “secret menu” that only Thai people know about; our goal at Immm is to introduce these real Thai dishes to a greater audience.” This rings true in the food they serve. There are no substitution of ingredients, no compromise in the food, and flavors are not altered, which reflects a level of authenticity of in their dishes which range from northern/northeastern to central and southern Thai regional cuisines. Suriyawan and Tosakulwong will be taking it a step further on October 14th for the 48th Ward’s 2nd Fridays event by showcasing Khantoke, which is nonexistent on any Thai menu in Chicago. 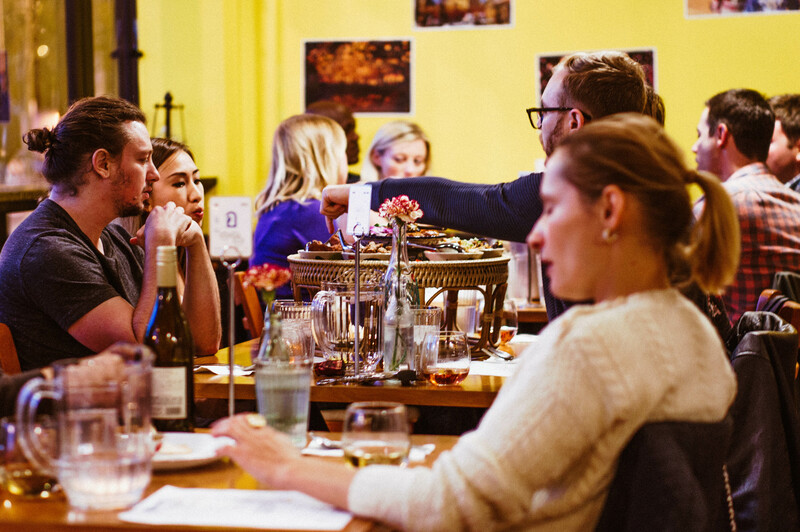 This culinary experience is a one-of-kind culinary experience not to be missed! - Crispy vermicelli noodles and tofu in sweet and sour dressing. - Young jackfruit, tomatoes, and pork cracklings, crispy shallots. - Chinese spinach and pork rib tips in tamarind soup. - Ground pork in spicy tomato sauce dip. *Menu contains shrimp products, nuts, and soy. We are unable to accommodate menu substitutions or alterations. Immm is BYOB. Suggested beers include Thai lagers Singha and Chang.